Yep, embarrassing. It doesn’t always look like this, these photos were taken several months ago when I was in the process of organizing other rooms in the house and it became a dumping ground for all those “what do I do with this?” items. Well, ok, who am I kidding – it almost always ends up looking like this. This was supposed to be my art room, but it’s too small and I don’t like to isolate myself when the creative urge comes over me. 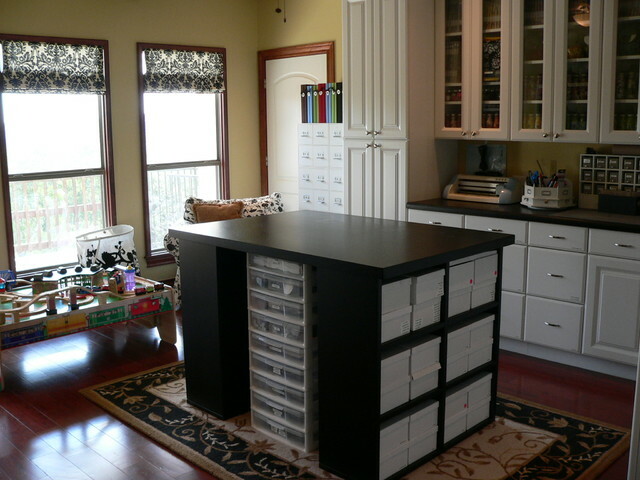 I’d usually take supplies out to work in the family room or dinning area which resulted in all my tools and supplies being stored in random parts of the house. Having to hunt around and travel through different parts of the house when working on a project was frustrating and discouraged me from doing any work. Clearly, I needed to rethink my idea of a functional space. A few days before Thanksgiving, our son moved back in and brought two friends with him. You might remember from earlier posts my frustration at the game of musical rooms we were playing in our house. I had finally reached a point when I thought the game was over and well, you can imagine reconfiguring rooms to accommodate a family of six from what was a family of three. The last one is stark but I see it as a blank canvas with tons of potential. The other photos are pretty typical of what I have in mind; along with a great view, a water source, access to the outdoors and large sliding doors that could open (or close) to the common living space. The problem is I don’t have a room big enough for all my wants. Or a budget big enough for that matter (maybe I should see about getting myself a coin minted). I could easily do this in a corner of our family room. One thing I would have to overcome is my need for tidiness. Things can get pretty messy when I’m “in the zone” and the thought of not having a door to hide the mess behind makes me a little uneasy. But, I finally accept the fact that homes are made for living in. Right? All homes have some “mess” and creative mess is the best kind of mess – it’s really a sign of a busy, active, creative mind. Right? If I am going to seriously throw myself into my art, the first step (one of many I’m working on) is to get over this idea of what I think a home should look like. I mean, it is totally unrealistic of me to think I should be prepared for the Elle Decor staff to drop in at any moment. Right? Too often we lock onto the glamor shots in those staged rooms we see in decorating magazines. 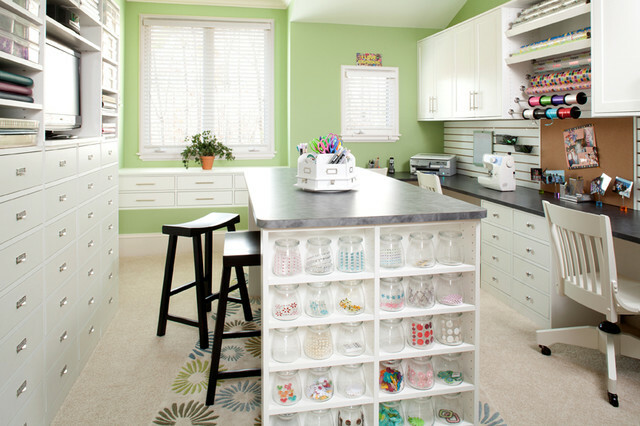 We believe the make-over shows where an entire crew makes over a room for a homeowner, even down to organizing the drawers, folding pairs of socks into perfect little squares. We forget about FUNCTION and our habits: in short, what works for us. I received the art table for Christmas from my hubby and I love it. I’m still working on finding a comfortable stool, but the wicker trunk works well for sitting and storage (I was pretty excited to find it at a yard sale for $10.00!) 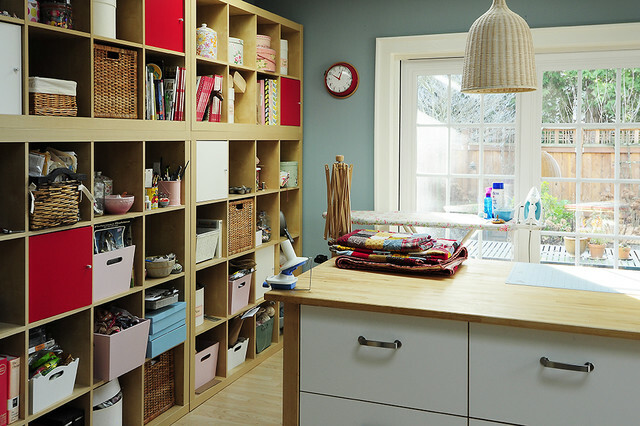 The open shelving lets me find everything easily, which also makes clean up easier. 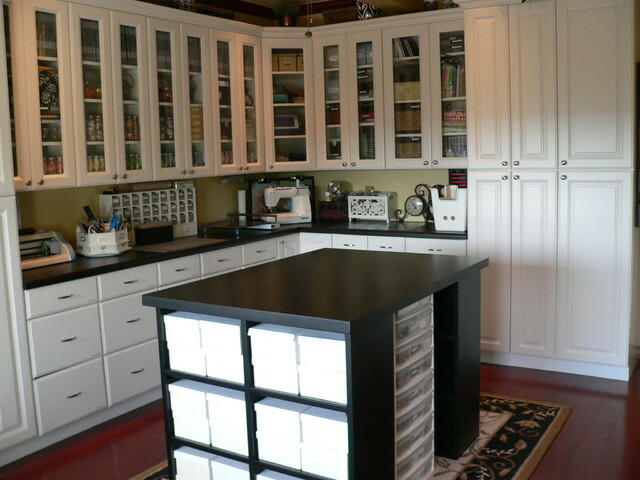 I am not crazy about the plastic drawer unit – but it is made really well and is very functional. Yes, there is chocolate stashed here somewhere. Can you find it? Surprisingly, I don’t feel distracted by all this clutter. In fact I find it much easier to get inspired and motivated to work. So I have finally created my space in this crazy place and I’m ready to get to creating. I’d love to see photos of your work space and of course, I’m always open to new ideas and suggestions. Please do share! Marie, you really need to open your own interior decorator office (or start by working for one)…so much talent bottle in!!! You and Joe are my biggest cheerleaders! Thank you. I am actually considering doing something like that, just not sure how to start. Sure wish I had your business sense! This turned out amazing! I can see how you took elements of your inspiration and really used them in your space to work for you. Brilliant!!! Thank you so much. I always enjoy seeing your projects as well. Thanks for dropping by. So many months have passed and I’m still trying to organized my work place. Love this!! So pretty and really love the chest for 10 bucks. Wow! !